She is up. Nobody wants to lay gems for her. They only do bundles to stronger heroes. So is Azmodan going to get nerfs or nah? An idea for fixing Alterac Pass? The problem with AV is that the first team who gets to the objective wins. I got a near 100% win rate by simply taking over the grounds near the objective 10 seconds before the spawn. This is because the objective spawns in places which are too easy to defend and too hard to attack. This is simply a flaw in the map terrain. It never gets to 0. Decay has a cap. 10) Blink <- Must pick. Heals, allows for escapes, goes through terrain... good stuffBlink heal is not a must pick. I hate it when people pick it and clearly the winds were needed. How does Fenix still have such a high winrate? 09/28/2018 09:17 AMPosted by AhriHe's gotten nerf after nerf and he is still so super strong sitting at 53.7% winrate on hotslogs.How? How can he still have this high winrate after so many nerfs? 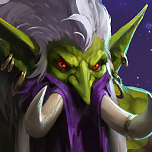 How overpowered is this hero actually?No ammount of nerfs can balance a broken design.